The Foothill Farms® K-12 Recipe Challenge kicked off this April and runs until September 30, 2014. Foodservice professionals may submit up to four recipes during the promotional period, earning a $100 airline gift card per recipe submission. This is not a contest, but rather a reward for submitting unique recipes using Foothill Farms® products. The gift cards can be used for any type of travel and is not limited to ANC. We want to help send more school foodservice professionals to School Nutrition Association’s Annual National Conference (ANC) July 13-16, 2014 in Boston or July 12-15, 2015 in Salt Lake City . The Foothill Farms® K-12 Recipe Challenge kicked off this April and runs until September 30, 2014. Foodservice professionals may submit up to four recipes during the promotional period, earning a $100 airline gift card per recipe submission. This is not a contest, but rather a reward for submitting unique recipes using Foothill Farms® products. The gift cards can be used for any type of travel and is not limited to ANC. Foothill Farms® designed this challenge to entice more school foodservice professionals to try dry-blend, speed scratch products. It’s helpful to see how foodservice professionals utilize the K-12 product line in their daily menu planning. Directors, dieticians, managers or other foodservice employees may submit recipes. They do not have to be existing customers. The basic requirements for recipe challenge submissions are: original recipe, recipe name, ingredient list and ingredient measurements, complete preparation/cooking instructions, complete nutritional information, and meal pattern information. One of the ingredients must be a Foothill Farms® product. Each submitter can choose which airline they would like to use for travel: Southwest, American Airlines, Delta, United or US Airways. The challenge is designed for individual submissions, however, if two people work on the recipe together, Foothill Farms® will split the gift card amount and distribute a $50 gift card to each person. Gift cards are awarded upon receipt and verification of the recipe. The recipes cannot resemble the recipes currently on Foothill Farms® website. For more specific challenge information, please visit the Foothill Farms® website www.foothillfarms.com/k12 or contact customer service at 800-442-5242. Schools that have submitted recipes will be announced via our social media pages. To find out which schools and what recipes, follow us on Twitter and like us on Facebook. DOWNLOAD THE ENTRY FORM – CLICK HERE! Customization Options are in the Sauce! Consumers want more power over the dishes they are eating through flexible menus and by choosing their own ingredients for a particular dish. Having a few classic or signature sauces on hand that are easily adaptable will increase the options served on a daily basis and help satisfy even the most discerning customer. We are no longer working in a one flavor fits all industry. The number one food trend according to Technomic’s 2013 Year in Review: 10 Macro Consumer Foodservice Trends is customization. Consumers want more power over the dishes they are eating through flexible menus and by choosing their own ingredients for a particular dish. Our chefs enjoy seeing how many dishes one sauce mix can create! How do you achieve this daunting prospect of individual choice in foodservice? Look no farther than the sauce! By offering a spectrum of sauce choices customized from a few Foothill Farms® basic sauce mixes, food professionals leave room for individuality on a much bigger stage. Having a few classic or signature sauces on hand that are easily adaptable will increase the options served on a daily basis and help satisfy even the most discerning customer. Chicken, fish, beef…let’s face it, if a sauce is drizzled over it, the dish instantly moves up the gourmet ladder. Foothill Farms® Béchamel Sauce mix easily transitions into a mild Mornay Sauce, ready to embrace a baked tilapia filet. The same mix can make a velvety smooth Veloute´ Sauce to serve over a grilled chicken breast. Moreover, our Béchamel Sauce mix is the base for our Blue Cheese Sauce and Gorgonzola Sauce recipes. Looking at our product this way illustrates the benefits of using dry mix. Sauce mixes become customizable food art simply by adding a handful of fresh ingredients. 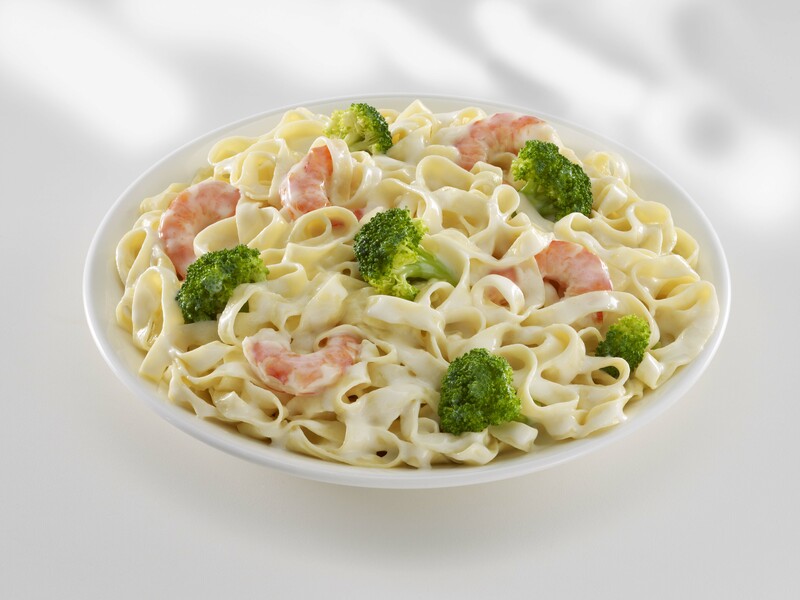 Likewise, a kid and senior-friendly Alfredo Sauce has a multitude of applications. It can be tweaked to form a Ragin Cajun, palate-pleasing blackened fish topper, transformed into a creamy, Memphis BBQ Parmesan Sauce, or whipped into a pasta-ready Garlic Alfredo Sauce. Do we have you mentally creating new dishes already? Wait, we haven’t even discussed dessert! Satisfy the sweet tooth with Foothill Farms® Crème Anglaise Custard Sauce which is every bit as customizable as the entrée sauces. Crepes or bread puddings topped with Lemon Crème, Raspberry Rum Crème, and White Russian Crème will finish any dinner on a high note while Chocolate Peanut Butter Crème and Almond Crème beckon for a partner of ice cream or cookie wafers. Implementing dessert sauces stretches menu offerings and accentuates chefs’ craftsmanship. Serve a sauce as a dip! If the goal is to take menu choices further without increasing food costs, trying dry sauce mix is worth the experiment or should we say EXPERIENCE! Trust us! Behind-the-scenes, our chefs enjoy seeing how many dishes one sauce mix can create! Author Foothill FarmsPosted on April 1, 2014 April 1, 2014 Categories classic sauce, culinary, customization, dry mix, dry sauce mix, food costs, food professionals, Foodservice, foodservice trends, Foothill Farms, ingredients, menu choices, menu ideas, Recipes, restaurant menu, sauce mix, seasoning mix, signature sauce, TechnomicTags Alfredo sauce, Almond Creme, BBQ Parmesan sauce, Bechamel sauce, blue cheese sauce, cajun, chef, Chocolate Peanut Butter Creme, classic sauce, Creme Anglaise Custard sauce, customer, dessert sauce, dry sauce mix, entree, entree sauce, food costs, foodservice, foodservice professionals, foodservice trends, Garlic Alfredo sauce, gorgonzola sauce, ingredients, Lemon Creme, menu, menu applications, menu choices, menu options, Mornay sauce, Raspberry Rum Creme, sauce mix, signature sauce, Technomic, Veloute sauce, White Russian CremeLeave a comment on Customization Options are in the Sauce!